United States Planned To Attack Britain! War Plan Red was a contingency plan of the United States military outlining a theoretical war between the United States and the British Empire (the “Red” forces). It was developed by the United States Army during the mid 1920s, and was officially withdrawn in 1939, when it and others like it were replaced by the five “Rainbow” plans created to deal with the Axis threat. The plan was amended in 1934 to authorize the use of poison gas against the Canadians and to strategically bomb Halifax in the event that it could not be captured. It was added to again in 1935 at the request of General Douglas MacArthur “to initiate, when the situation permits, offensive operations to secure the Winnipeg and Vancouver Areas.” The following text is a supplement submitted on December 18, 1935 by the G2 intelligence division of the United States War College, outlining the road, rail, and sea routes to target cities in Canada. Pagination is from the original text. Major Charles H. Jones, Infantry, Chairman. Lt. Col. H.W. Crawford, Engineers. Determine under the geographical factor, the critical areas in Crimson (Canada) and the best approaches thereto for Blue. A critical area is assumed to be any area of such strategic importance to either belligerent that control thereof may have a material bearing on the out- come of the war. Canada is shown on the Map herewith (see Exhibit A). It comprises the entire northern half of the the North American continent, excepting only Alaska and the coast of Labrador, a dependency of the colony of Newfoundland. The principal political subdivisions are those located along the border of the United States. These from east to west are:(1) The Maritime Provinces:Prince Edward Island.Nova Scotia.New Brunswick. (2) Quebec. (3) Ontario. (4) The Prairie Provinces:Manitoba.Saskatchewan.Alberta. The great area in eastern Canada underlain by rocks of Precambrian age is known as the Canadian Shield. Its northern boundary crosses the Arctic archipelago; the eastern boundary lies beyond Baffin Island and Labrador, and reaches the depressed area occupied by the St. Lawrence, a short spur crossing this valley east of Lake Ontario to join the Adirondack Mountains of New York. The southern boundary runs from this spur west to Georgian Bay thence along the north shore of Lake Huron and Lake Superior, thence northwest from the Lake of the Woods to the western end of Lake Athabaska. Its average elevation does not exceed 1500 feet. The greatest known elevations are in the eastern part of Baffin Island and along the coast of northern Labrador. Peaks of the Torngat Mountains of Labrador have elevations of between 4000 and 5000 feet. The coast is one of the boldest and most rugged in the world, with many vertical cliffs rising 1000 to 2000 feet high. Occasional exceptions occur in which there are reliefs of several hundred feet, as in the hills along the north shore of Lake Huron and Lake Superior. The area is dotted with lakes, large and small, and of irregular outline. A lowland of considerable extent stretches for some distance into Ontario and Manitoba from Hudson Bay. Extending south and west form the Canadian Shield, between the Appalachian Mountains on the east and the Cordilleras on the west, lies the Great North American plain. The northeastern portion of this plain called the St. Lawrence lowlands occupies southern Ontario, south of a line extending from Georgian Bay to the east end of Lake Ontario; eastern Ontario lying between the Ottawa and St. Lawrence rivers, and that part of Quebec lying adjacent to the St. Lawrence between Montreal and Quebec. The plain west of the Canadian Shield, known as the Interior Plains, stretches northward to the Arctic Ocean between a line approximately joining Lake Winnipeg and Lake Athabasca, Great Slave Lake and Great Bear Lake on the east, and the foothills of the Rocky Mountains on the west. That part of the St. Lawrence Lowlands lying in the eastern angle of Ontario, and in Quebec south of Montreal and extending down the St. Lawrence is comparatively flat and lies less than 500 feet above sea level. On the lower St. Lawrence it is greatly narrowed by the near approach of the Appalachian system to the Canadian Shield. The part lying adjacent to Lakes Ontario, Erie and Huron is of less even surface, has its greatest elevation of over 1700 feet south of Georgian Bay and slopes gently to the Great Lakes. The Interior Plains region is in general rolling country with broad undulations and a slope eastward and northward of a few feet per mile, descending from an elevation of 3000 to 5000 feet near the mountains on the west to less than 1000 feet at the eastern border. The rolling character of the area is relieved by several flat topped hills, by flat areas that formed the beds of extensive lakes, and by deep river valleys. New Brunswick, Nova Scotia and Prince Edward Island is an alternation of upland with hills and ridges rising 2500 feet and higher. Adjacent to the Bay of Fundy is a series of ridges rising in places to 1200 feet. Between these two New Brunswick uplands, which converge toward the southwest is a lowland forming the whole eastern part of the province. This lowland extends east to include Prince Edward Island, the western fringe of Cape Breton Island and the mainland of Nova Scotia north of the Cobequid mountains, which have an elevation of 800 to 1000 feet. South of the Cobequid Mountains lies a long narrow lowland stretching from Chedabucto Bay to Minas Basin, and along the Cornwallis Annapolis valley between North and South Mountains. South of this lowland is a highland sloping to the Atlantic Coast. The northern part of Cape Breton Island is a tableland 1200 feet high with its central part rising to an elevation of over 1700 feet. The Cordelleran region, a mountainous area bordering the Pacific extends from the United States through Canada into Alaska and embraces nearly all of British Columbia and Yukon and the western edge of Alberta and the Northwest Territories. The eastern part of the Cordillera is occupied by the Rocky Mountains, with peaks rising to 10,000 feet and 12,000 feet. They extend northwest and fall away towards the Liard River. The western part of the Cordillera is occupied by the Coast Range and the mountains of Vancouver and Queen Charlotte Islands. The Coast Range rises to heights of 7000 to 9000 feet. Between the Rocky Mountains and the Coast Range lies a vast plateau 3000 to 4000 feet high and cut by deep river valleys.3. Population. According to the census of 1931, the total population on June 1, 1931 was 10,376,786, of whom 5,374,541 were males. The inhabited areas of the Dominion are essentially confined to a narrow strip alolo the United States boundary, generally south of the 56th parallel of latitude west of the Lake Winnipeg, and south of the 49th parallel of latitude east of Lake Superior. Approximately 10% of the total population are found in the Maritime provinces, 61% in Quebec and Ontario, 23% in the Prairie Provinces and 6% in British Columbia. Of the present population, 51.86% are of British descent, 28.22% French, and the remainder of widely scattered nativity.4. Climate. The climate of southern Canada is comparable to that of the northern tier of the states of the United States. The west coast of British Columbia tempered by the Pacific Ocean is mild and humid. The prairie provinces generally experience extreme cold weather from November to March, with heavy snow fall. The climate of southern Ontario, the St. Lawrence Valley and the Maritime Provinces is much milder that that of the prairie provinces, but freezing temperatures are general between the end of November and the first of April, and the ground is usually covered with between one and three feet of snow. Any extensive military operations in Canada between November 1st and April 15th would be extremely difficult, if not impossible.5. Communications.a. Railways. There are only two railway systems in Canada, both crossing Canada east and west from the Atlantic to the Pacific. These lines generally parallel the United States border, in some instances crossing through the United States. terminus at Saint John, N.B. and it western terminus at Vancouver, B.C. As indicated by the systems maps, there are numerous branch lines serving the industrial and farming areas of the Dominion, and connecting lines tying in with various railroads of the United States. From a military viewpoint, these railroads provide excellent trans- portation facilities for Blue, if invasion of Crimson is decided upon, and being located in close proximity to the border are, from the Crimson view- point, very liable to interruption. This is particularly true at Winnipeg some 60 miles north of Blues border, through which both transcontinental systems now pass. This fact probably encouraged Canada to construct the railroad from The Pass, Manitoba and develop the port at Churchill. Complete details concerning all railroads of Canada are contained in Appendix No. 1.b. Highways. In recent years Canada has greatly increased and improved her road con- struction and while there are enormous stretches of country, particularly in the northern portion of the Dominion, with few or no roads, the southern portion is well served with improved roads. A number of transcontinental motor roads are under construction or projected, the most important being the “Kings International Highway” from Montreal to Vancouver, via Ottawa, North Bay, Sudbury, Sault Ste. Marie, Winnipeg, MacLeod, Crow’s Nest Pass, Fernia and Cranbrook. Another highway is being constructed from Calgary to Vancouver. The principal roads in Ontario, Quebec and the Maritime Provinces are shown on Inclosure D, herewith. Roads in the Prairie Provinces and British Columbia are shown on inclosure E.
The majority of improved roads are classified as gravel; macadam and concrete construction amounting to only 7870 miles out of a total of some 95,000 miles improved. Gravel roads will require extensive maintenance under heavy motor traffic, especially during the spring.c. Water Transportation. (1) Inland Waterways. of 30.0 feet is available, adequate for the great majority of ocean shipping. Pennsylvania and West Virginia to Ontario, Quebec and the northwest. The locks at Sault Ste. Marie, the boundary channels between Port Huron and Detroit and to a lesser degree the Welland Canal are the critical points on this waterway and effective control of such areas is vital to Blue. Navigation on the Great Lakes is generally closed by ice from about the end of November to the first of April. The St. Lawrence River is ordinarily ice bound for a similar period, but somewhat later about early in December to the latter part of April. While there are a number of Canadian lake ports of importance, Montreal is the only one which would not be automatically closed by Blue control of the Lakes. Montreal is also an important ocean port and will be considered along with other deep sea ports. (2) Ocean Shipping. The Dominion of Canada owns and operates a cargo and passenger carrying fleet consisting of some 57 cargo vessels and 11 passenger ships. Note: The above figures do not indicate amount of commerce; Register tons are gross tons. (Namely cubical contents in cubic feet divided by 100) less deductions for crews space, stores, etc. A brief description of the above ports to indicate size, avail- able depths and important terminal facilities is included in Appendix No.2. -45- The port of Montreal, favorably located at the head of ocean navigation on the St. Lawrence and the foot of inland navigation of the Great Lakes, is a natural shipping and railroad center. The port of Quebec is less favorable situated economically being more than 100 miles northeast of Montreal. Strategically, however, Quebec controls the commerce of Canada moving to or from the Atlantic seaboard. Its possession by Blue would interrupt eastern rail and water communication between England and the Mari- time Provinces and the rest of Canada. The port of Halifax is one of the best harbors on the Atlantic Coast and the principal winter port of Eastern Canada. The harbor has been ex- tensively developed by the Dominion government as a modern ocean terminal and naval base. It is fortified, though much of the armament is obsolescent. In case of war with Red, Halifax would become of prime importance to Red as a naval base and as a debarkation point for overseas expeditions in case Blue controlled the St. Lawrence. However, the routes available for a Red advance from Halifax into northeastern United States or towards Quebec and Montreal are quite difficult. The port of Saint John, New Brunswick is similar in many respects to the port of Halifax. It is open throughout the year and equipped with the most modern terminal facilities, including one of the largest drydocks in the world. It is an important shipping center for grain and dairy products. Due to the proximity of the port to the United States border and the fact that the principal rail connections (C.P. Ry.) passes through the state of Maine, the port would be of little use to Crimson or Red, at least in the early stages of war, provided Blue made any effort to control this area. The port of Vancouver, B.C. came into prominence with the opening of the Panama Canal, providing an alternate route to that of the transcontinental railroads for grain, dairy, lumber and the other products of western Canada to Europe. The port of Victoria, on Vancouver Island, is similarly situated, but due to the absence of rail connection with the mainland is more concerned with passenger and mail traffic than with bulk commodities. Esquimalt, two miles west of Victoria, and the only Canadian naval base on the west coast, is equipped with a large modern drydock, and affords good anchorage for the largest vessels. Consequently this area is of prime importance to Crimson. With the closing of the Panama Canal to Red traffic and the presence of Blue naval forces based on Honolulu, its commercial value is largely destroyed. Assuming that Blue controls the St. Lawrence and cuts Crimson’s eastern communication with Red, the areas importance is enhanced, although it remains a decidedly unsatisfactory outlet. If Red should win control of the Pacific steamship lanes, the area becomes of first importance to Red. All factors considered, it must be controlled by Blue. The port of Prince Rupert is a first class harbor with modern terminal facilities and excellent and extensive anchorages. It becomes of extreme importance to Crimson, if and when they are denied the use of the southwest British Columbia ports, although, as in the case of Vancouver, it affords a most unsatisfactory and hazardous route to Europe. Physical occupation of Prince Rupert harbor by Blue is not vital, but closing the port to ocean traffic should be effected. to Europe, via Churchill is from 500 to 1000 miles shorter than the rail- water route via Montreal. 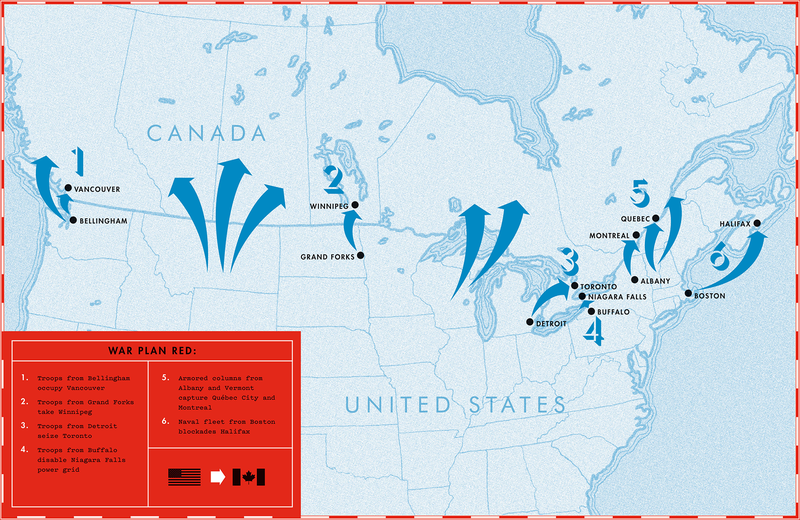 In case Red is denied the use of the Atlantic or Pacific ports, or both, Churchill will afford an outlet for grain and meat products from Ontario, Manitoba and Sasketchewan and an inlet for military supplies and troops from Europe unless the northern trade route through Hudson Strait is controlled by the Blue fleet, and this is improbable.d. Air Transportation (Civil). During 1933 there were 90 commercial aircraft operators in Canada. Their activities included forest file patrols, timber cruising, air photography, transportation of passengers, express and mail, etc. To encourage a more widespread interest and knowledge of aviation the Department of National Defense, since 1928, has issued two light air- planes and made certain grants to each of 23 flying clubs and a large air terminal has been built at St. Hubert, seven miles south of Montreal and a terminal airdrome at Rimouski, Quebec for the reception of trans-atlantic mails. At the close of 1934 there were 101 air fields of all types, 368 civil aircraft and 684 licensed pilots in Canada. Some details of airports in New Brunswick and Nova Scotia are given in a letter from the Office of the Chief of Air Corps, herewith. (See inclosure F)e. Telephone and Telegraph. (1) Cables. Six transoceanic cables have termini in Canada, five on the Atlantic and one on the Pacific. The Atlantic cables are landed at Halifax, though several of them are routed through Newfoundland. The Pacific cable lands at Vancouver from whence a cable also leads to the United States. (2) Radio. A transoceanic commercial radio beam service is carried on by a station at Drummondville, Quebec, with Australia, Great Britain and the United States. In 1932 a direct radio telephone circuit with Great Britain was opened through the medium of this beam station. (3) General. Canada is well supplied with local telephone, telegraph and radio service. Interruption of Canada’s trans-oceanic telegraph and radio service will seriously handicap Red-Crimson cooperation.6. Other Economic Factors.a. Agriculture. Agriculture, including stock raising and horticulture, is the chief single industry of the Canadian people. Canada is not only self-sustaining, as far as food is concerned, but has a large excess for export. Food production is varied and so distributed throughout the dominion that each section is practically self-sustaining and cutting her off from the outside would would mere serve to deny her people certain luxuries, such as coffee, tea, sugar, spices and tropical fruit. The Maritime Provinces are noted for their fruit and vegetable crop, particularly for the oat and potato crops of Prince Edward Island and New Brunswick and apples in Nova Scotia. Quebec and Ontario are mixed farming communities with the Niagara peninsula specializing in fruit. Manitoba, Saskatchewan and Alberta are the principal wheat producing centers, with other grains and stock raising of increasing importance. The rich valleys of British Columbia produce apples, other fruit and vegetables. The principal forests are in the provinces of British Columbia, Ontario, Quebec, New Brunswick and Nova Scotia. The manufacture of lumber, lath, shingles and other products such as paper pulp, is the second most important Canadian industry.c. Mineral Resources. Canada is one of the greatest mineral producing countries of the world. Nova Scotia, British Columbia, Quebec, Ontario, Alberta and the Yukon Territory contain the chief mining districts. The following summary notes pertinent facts concerning minerals of primary military importance. Aluminum. Aluminum was the 16th ranking Canadian export in 1934. Large quantities of bauxite, the principal source of supply were imported from the United States. From United Kingdom       1,942,875  "
Total - - - - - - ............................22,265,235 tons. In case of war with the United States, Canadas coal imports from this country would be cut off and her railroads and industrial activities seriously handicapped. If Blue controlled the Quebec area and Winnipeg, Canada’s railroads and industries dependent upon “steam power” would be crippled. Canada ranks seventh among the nations as a producer of iron and steel but only a small percentage of her production is derived from domestic ores, in view of the abundant supply of higher grade ores in Newfoundland and Minnesota. The Wabana section of Newfoundland contains the largest known single deposit of iron ore in the world. There are large iron ore deposits in Quebec, northern Ontario and British Columbia but for various reasons they are handicapped for blast furnace treatment. Iron and steel are produced in Nova Scotia (Sydney) and in Ontario. Iron ore is obtained from the Mesabi Range in Minnesota, via the Great Lakes and from Newfound- land. (See slide 14856) The bulk of iron and steel products, however, are imported, principally from the United States and the United Kingdom. Lead is obtained in Canada largely from deposits in British Columbia, the largest porting being exported to England. The world production of nickel in 1933 was about 50,736 tons, of which about 82% originated in the Sudbury district, north of Georgian Bay in Ontario. The remainder came chiefly from New Caledonia (Fr.). A new deposit of nickel was recently discovered in northern Saskatchewan but has not yet been worked. Nickel is necessary to industry and indispensable in war. Control of the Sudbury mines, in case of war, is therefor of vital importance. The production of crude oil or petroleum in Canada during 1934 amounted to 1,417,368 barrels, principally from the Turner Valley field in Alberta. A small amount is also obtained from wells near Monkton, New Brunswick and in southwest Ontario, between Lake Huron and Lake Erie. Considerable quantities are also imported from the United States. Canada ranks fourth among the worlds producers of zinc. Her out- put in 1934 totaled 298,579,531 pounds. The principal producing mines are located in the Kootenay district of British Columbia and near Flin-Flon in northwest Manitoba. Approximately 2/3 of the zinc exported goes to Great Britain.d. Manufacturing. (1) General. Slaughtering and meat packing    92,366,137. Flour and food mills             83,322,099. Bread and other bakery product   51,244,162. Cotton yarn and cloth            51,197,628. Hosiery and knitted goods        40,997,210. Ottawa Car Mfg. Co.............Ottawa, Que. Armstrong-Siddeley Motors Co. at Ottawa, Que. Aero Engines of Canada at Montreal, Que. Canadian Pratt-Whitney Aircraft Co. at Longueuil, Que. cases, explosives, gun forgings, machine guns and small arms ammunition. factures some small arms and artillery ammunition. Aluminium, antimony, bauxite, barytes, camphor, chromite, coal, cotton, flax, hemp, iron, jute, kaolin, manganese, mercury, nitrates, phosphate, petroleum, opium, quinine, rubber, silk, sugar, sulphur, tea, tin, tobacco and wool. large majority serving under 7 year enlistments. In addition certain specialists are loaned from the British Royal Navy. The Reserve consists of from 70 to 113 officers and from 430 to 1026 men recruited from sea-faring personnel. 1931  Destroyer     1337 tons    Saguenay    Halifax, N.S. In comm. 4-4.7"
1931     "          1337  "      Skenna      Esquimalt,B.C. " "    4-4.7"
1919     "           905  "      Champlain   Halifax, N.S.  " "    3-4"
1919     "           905  "      Vancouver   Esquimalt,B.C. " "    3-4"
1918  Mine Sweeper   360  "      Armentieres Esquimalt,B.C. " "
1918   "     "       360  "      Ypres       Halifax, N.S.  " "
to a strength of 60,000 at M plus 15 and to full strength of 126,000 in M plus 30 days. (Note: This estimate is approximately twice that of G-2, First Army.) New troops will begin to appear in 180 days at the rate of 50,000 monthly.d. Air Service. The Royal Canadian Air Force operates under a directorate in the office of the Chief of Staff of the Army. The equipment consists of some 84 combat planes with probably 20 on order. (G-2 estimate) The Armaments Year Book, League of Nations, gives a total of 166 planes of all kinds and the Statesman Year Book, 1935 gives 189 planes of all kinds. It is probable that about one squadron of pursuit and one squadron of observation could be organized for immediate service.e. Comment. the Pacific, and even then is too remote from critical Blue areas. *Under certain conditions this force might be landed in Canada by 30 M.
following forces can probably be landed in Canada as indicated. and the Montreal-Quebec line in order to hold bases of operation for Red. critical points on her transcontinental railroad lines. 8. Areas of Strategic Importance. b. The Montreal Quebec area, sometimes called the St. Lawrence Area. c. The Great Lakes Area. (3) Sault Ste. Marie Area. (1) Winnipeg City and vicinity. (1) Ports of Vancouver and Victoria, area. to operate against Blue naval forces or commercial shipping. and Red (except from Newfoundland) and between Crimson and the West Indies. 1. Deny Red the use of St. John Harbor. and St. John and the remainder of Canada. Red) from Halifax, on the shortest possible defensive line. (2) Montreal - Quebec Area (St. Lawrence River Area). Quebec, due to its physical location, is the key point of the area. (a) Deny the use of all good St. Lawrence River ports to Red. ural centers from the eastern seaboard. air bases in eastern Canada. well as all imports via the Atlantic. (3) The Great Lakes Area. (a) Niagara River crossings and Welland Canal. (b) The waters connecting Lake Huron and Lake Erie. between Lake Huron and Lakes Erie and Ontario. (e) The Sudbury nickel-copper mines. against highly industrialized areas in the United States. an alternate route to Europe via Moosonee, Ont., and the Tem. and Ont. (5) Vancouver - Victoria Area. Puget Sound area; and interrupt cable communication with the far east. 9. Routes of Approach to the Areas of Strategic Importance. a. Halifax - Monkton - St. John Area (Maritime Provinces) (Incls. D & H). (1) Via water from Boston or New York to Halifax or vicinity. and thence overland to Halifax. Amherst - Truro to Halifax. attack would require a large force and would involve undesirable delays. advance would be over difficult terrain. est, being some 16 miles by road west of Halifax, appears satisfactory. whence improved roads lead to the main highway. contour and the terrain between the roads and the water is greatly rolling. Halifax it is considered inferior to the route from St. Margarets Bay. (3) The All Land Route via Eastern Maine. is navigable from the mouth to the falls some distance above Woodstock, N.B. suspension bridge span the river about one mile above the city of St. John. before Red reinforcements can be landed or Crimson organize for its defense. make the capture extremely difficult - a major operation. this route impracticable, and the all land route necessary. from northern New York, New Hampshire and Vermont and from northwest Maine. Other streams will create obstacles of lesser importance. 6 1/2 foot draft throughout its length. where it turns sharply northwest to flow into the St. Lawrence (Lake St.
swampy areas between it and the Becancour River. (e) The Becancour River rises about 5 miles northwest of Lake St.
Francis and flows north, then southwest, then northwest to enter the St.
strong swift stream with an average discharge of over 4000 feet per second. reaches. From St. Maxine to the St. Lawrence it is 600 to 1500 feet wide. This river must be considered a serious obstacle. banks generally high and steep. It forms a considerable obstacle. east of the Richelieu River, is hilly verging on mountainous (up to 3000'). northeast to the meridian of Quebec, thence northeast parallel to the St.
of the river there are densely forested areas at intervals. net available is shown on inclosure No. "D" and "K."
are entirely adequate for any probable movement against this area. treal. Distance 69.2 miles, all paved. bridges across the St. Lawrence at Montreal. Railroads: Delaware and Hudson - Albany to Montreal. New York Central - Malone to Montreal. Rutland and C.P. - Burlington to Montreal. Central Vermont and C.N. Montpelier to Montreal. (b) Northern Vermont and New Hampshire to Quebec. Chaudiere and Etchemin Rivers on the east tend to delimit the zone of advance. Victoriaville is an alternate route. numerous alternate routes and connecting roads. Canadian Pacific - Newport to Quebec. Canadian Pacific - Jackman via Megantic to Quebec. Canadian National - Portland, Me., via Sherbrooke to Quebec. est and best route of advance on Quebec. d. The Great Lakes Area. The Buffalo - Niagara River Area. The Port Huron - Detroit Area. The Sault St. Marie or Soo Locks - Sudbury Area. (1) The Buffalo - Niagara River Area. Lewiston, New York. " "   "
national boundary and is entirely adequate for any probably movement. east. Branch lines lead to all important parts of the Niagara peninsula. secured to assure a line of advance into the Niagara Peninsula of Ontario. (2) The Detroit - Port Huron Area. Ambassador Bridge - Detroit - Windsor. Two tunnels (one railroad) Detroit - Windsor. available for any advance eastward from Detroit and Port Huron. Port Huron - Detroit simultaneously. (3) Sault Ste. Marie - Sudbury Area. of roads or other communications suitable for the movement of armed forces. sides of the border to supplement the hard surface roads. offers no natural obstacles to an advance. from Vancouver at the meridian of Mission City. nishes a satisfactory rail service. proach is by water from Port Angeles, Washington. (1) The Halifax-Monkton-St.John Area (The Maritime Provinces). (2) The St.Lawrence Area (Quebec and Montreal). (5) The Vancouver Area (Vancouver and Victoria). To  (1) By joint operations by sea from Boston. (2) From Northern New Hampshire-Vermont area. (3) (a) From Sault St. Marie and the Soo Locks Area. (b) From Port Huron - Detroit Area. and (c) From the Buffalo-Niagara Falls Area. (4) From Grand Forks-Crookston through Emerson. by an attack by water in Puget Sound. The committee concurs in the foregoing conclusions. Next HYBRID WARFARE – A Conceptual Perspective.